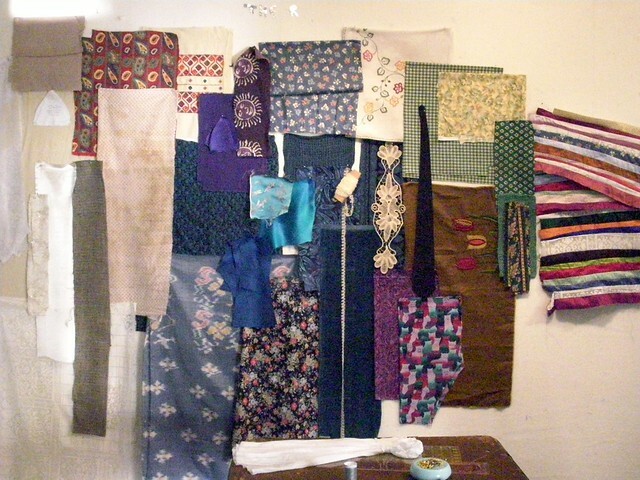 I am migrating a Passage Quilting project to daintytime from an earlier now defunct studio blog, which I used for the purpose of updating clients on their projects in progress. In 2009, Beth El Synagogue in Durham, NC commissioned me to do five Torah mantels from meaningful materials donated by the congregation. The project unfolded nicely and I think it's worth publishing more widely. I hope you will enjoy following the process posts on this project for the next few Wednesdays. Starting a new project. Materials for Beth El Synagogue Torah Mantels on the studio wall. Lots of blue and white. Good mix. All I need is something black. Would also like to use more kippot in lots of different colors. I like the curved triangular shape. Can imagine lots of these triangles scattered through the striped pattern. This project is on hold until I can see about the additional materials. Will there be enough for five mantels?